After reading through this week's Tuesdays With Dorie recipe for Banana Coconut Ice Cream Pie, I wasn't sure that this would be my cup of tea. Something about food processing together bananas and ice cream didn't whet my appetite. 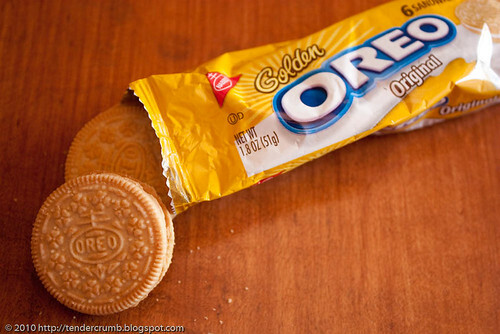 - This snack package of Golden Oreos, 1/2 Tspn butter and 1/8 cup of coconut was just enough to make the crust of my mini pie. - My ice cream concoction consisted of a scoop of Haagen Daz Chocolate Chocolate Chip, 1/2 medium banana, and 2 Tbsn dark rum (yes, I wasn't shy about this). After it takes a quick whirl in my mini food processor, the mixture is poured into the prepared crust over a layer of sliced bananas. My filling was really liquidy, so the pie needed to set in the freezer for a bit. 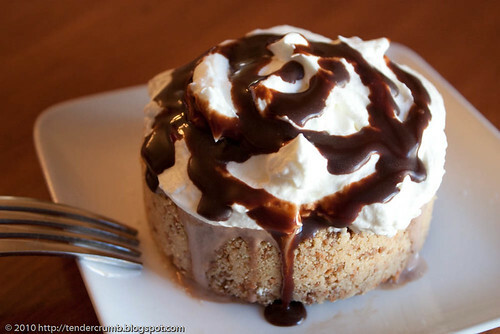 - After the pie set up, I topped it with whipped cream and a drizzle of chocolate sauce. 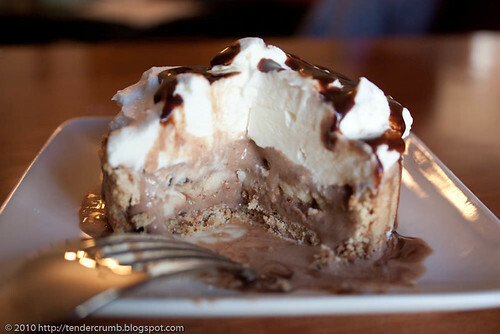 I was so surprised by how yummy this pie tasted! Since I was a little heavy handed with the rum, this pie totally reminded me of one of those boozey ice cream cocktails. The pureed bananas infused the chocolate filling with great banana flavor without affecting the consistency of the ice cream. Boy, did I regret scaling this recipe down. Next time, I'm making a whole pie! Thanks to Spike of Spike Bakes for this great pick this week. 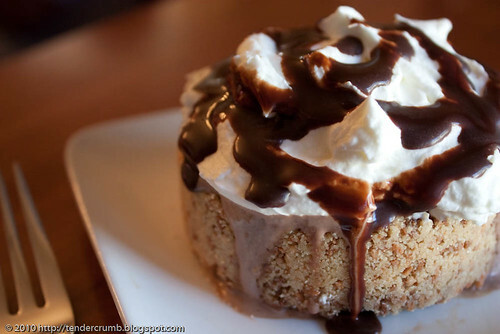 Visit Spike's blog for the full recipe. 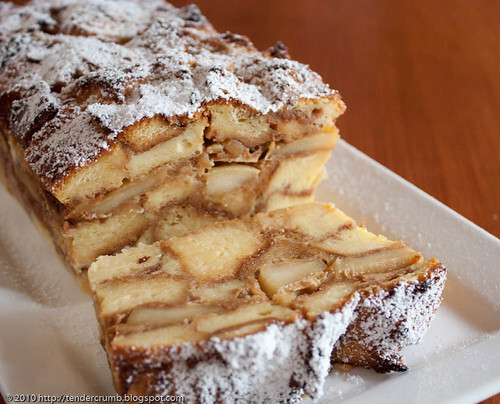 This week's Tuesdays With Dorie recipe for Apple-Apple Bread Pudding is all about comfort food that warms your tummy. 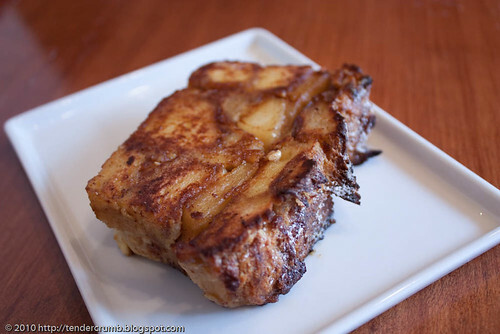 This recipe takes a traditional bread pudding and adds a double dose of apples - sauted sliced apples and apple butter. - I halved the recipe to accommodate a 8x3 loaf pan. - Challah was my bread of choice. 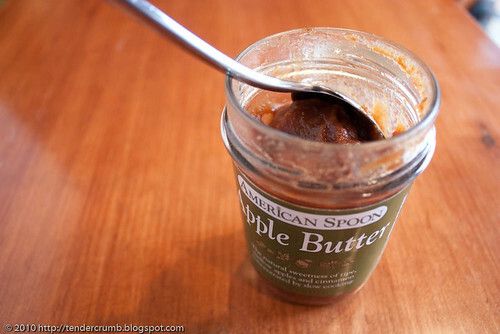 The bread was cut into thick slices, liberally slathered with apple butter, and then cut into cubes. 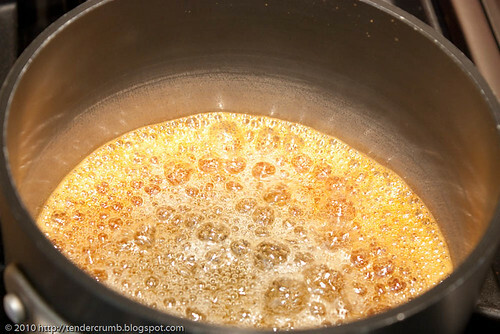 - 1/2 tsp of cinnamon was added to the custard mixture. - Once out of the oven, I let the bread pudding cool to room temp. After unmolding from the pan, the bread pudding is sliced, and these slices are fried on both sides with a generous amount of butter (just like frying up french toast). Sure, this is a total fat bomb but boy o' boy is it delicious! Frying creates a beautiful crust, and its slight crunchy exterior gives in to the soft, rich interior. Although the fruit is no longer distinguishable, the apple flavor definitely shines. A little dusting of powdered sugar and a scoop of vanilla ice cream is all you need to complete this dessert. Thank you Liz for this super delicious selection! With all of the gorgeous fruit on display at my local farmers market, I was super happy that Christine of Cooking With Christine decided on Quick Classic Berry Tart for this week's Tuesdays With Dorie recipe. 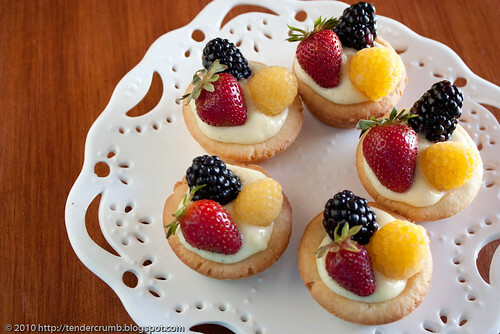 I definitely have a weakness for fresh fruit tarts. 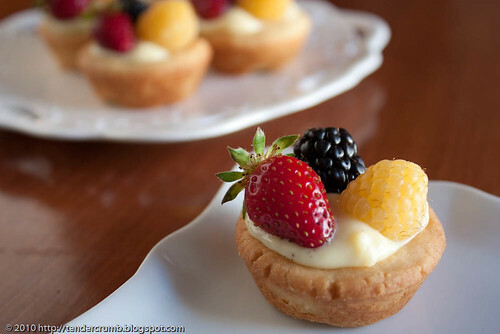 As I couldn't trust myself with a full-sized tart at home, I transformed this recipe into tartlettes --- I can have a little taste and then send the rest off to my hub's workplace. 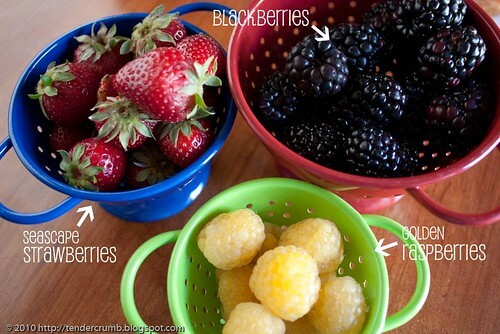 The berries were abundant at the farmers market this past weekend, and I had hard time narrowing down my choices. Strawberries were definitely overflowing in the stands, but I was drawn to some beautiful golden raspberries. Golden raspberries are milder and less tart than the red variety, with a flavor that reminds me of apricots. Although they're a bit pricey (5 bucks for a small basket), these gems are worth the occasional investment. As you can prepare the crust and pastry cream in advance, this beautiful dessert comes together super fast when it's time to serve it to your guests. - The tart crust recipe yielded 21 tartlette shells. 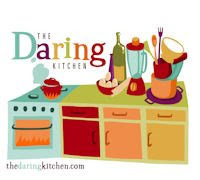 - The little shells are made by pressing portions of dough into a mini-muffin pan. I used a shot glass to evenly press the dough up the sides of the pan. 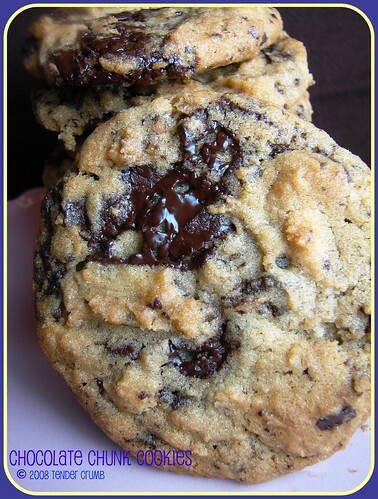 - After freezing the dough in the pan for one hour, it is popped in a 375 degree oven for 12-14 minutes. The freezing step is critical for the shells to hold their shape while baking. - I used vanilla bean paste instead of vanilla extract (I love the little vanilla bean specks in the cream). - I love Dorie Greenspan's pastry cream, but find that the amount of cornstarch makes the pastry cream a little too congealed for my personal preference. 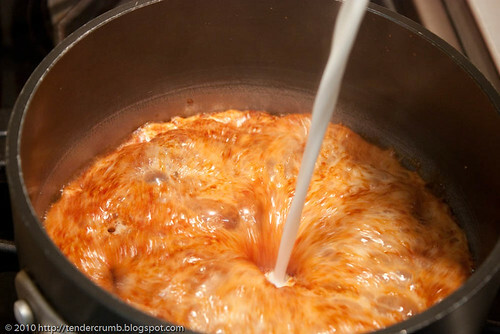 By reducing the cornstarch to 1/4 cup, I get the creamy consistency that I like. 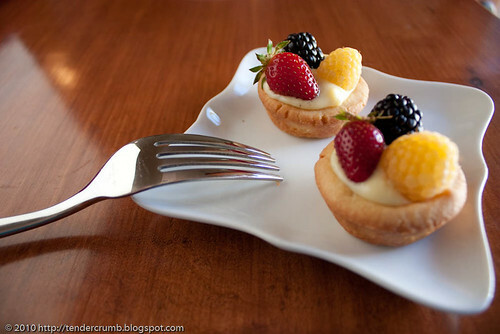 - I had quite a bit of pastry cream leftover, as a little dollop will fill each tartlette shell. Halving the recipe will yield more than enough pastry cream. I don't mind the leftover cream - it's a perfect filling for eclairs! - I skipped the drizzling of red currant jelly. You don't need a fork to enjoy these tarlettes - just pick them up with your fingers and pop them in your mouth! 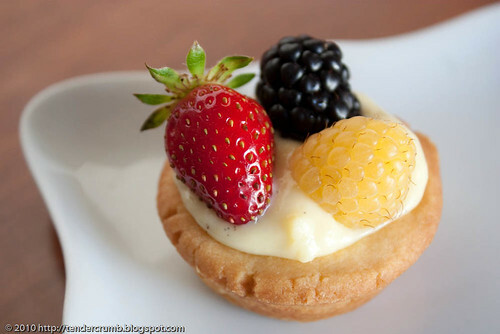 Buttery tart shell + creamy and slightly sweet pastry cream + sweet/tart and juicy berries = YUM!!! If you'd like the complete recipe for this delicious and easy tart, please visit Christine's blog. Oh yeah baby - this Burnt Sugar Ice Cream tastes as good as it sounds. 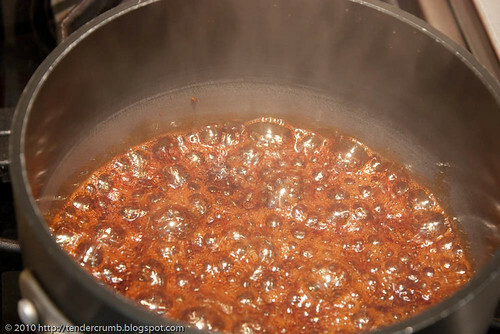 I love all things caramel, but have avoided making it from scratch --- I guess I've experienced one too many burnt sugar messes. This time, I watched my sugar like a hawk. This burnt sugar/cream mixture is combined with egg yolks to create the ice cream base. After the ice cream is churned and rests in the freezer, I'm ready to dig in. 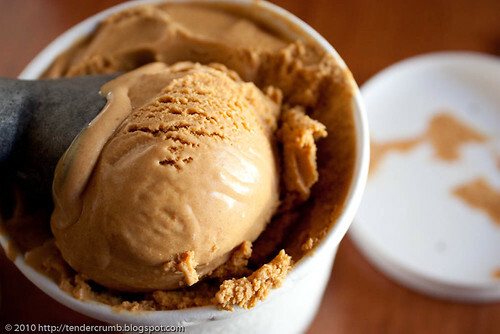 If you noticed, there is only one bowl...my hubs doesn't like caramel...this ice cream is all mine! 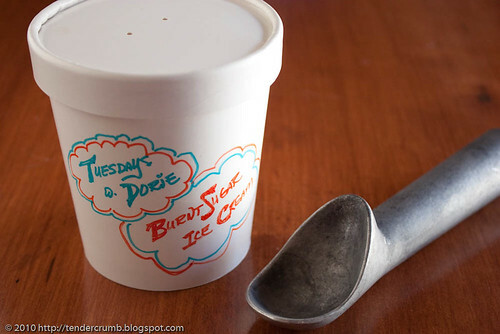 This ice cream had a wonderfully soft, almost velvety texture and it was super easy to scoop. 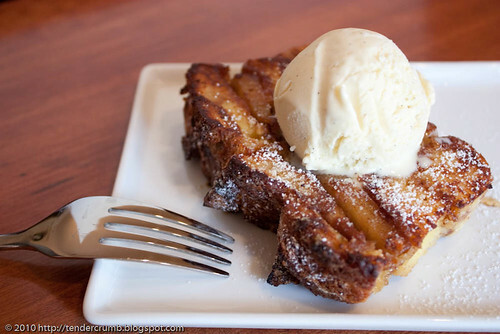 The burnt sugar imparts a slightly bitter flavor, which contrasts wonderfully with the subtle sweetness of the ice cream. My taste buds were very happy. 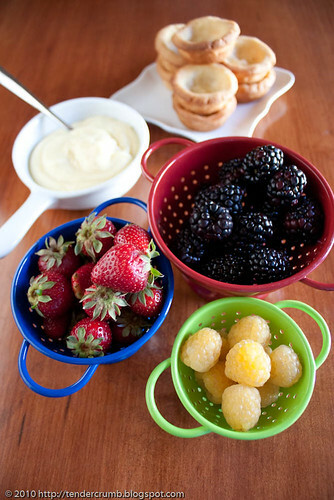 Thanks to Becky of Project Domestication for a fantastic pick this week! 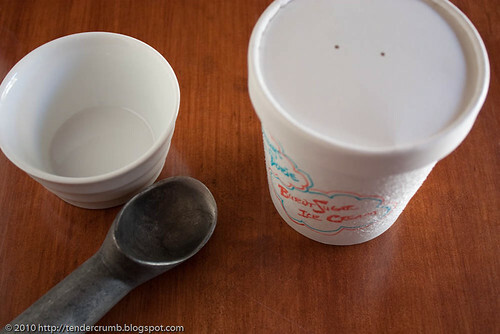 Make sure to visit Becky's blog for this unbelievably delicious ice cream recipe.